My wife’s Google+ Local page is already ranking on page one. It has no inbound links that I’m aware of, but I’m gonna give it one now and see what happens over time. I suspect it’ll pass that Active Rain profile soon enough. The other URLs have age/links in their favor (the ones from carimcgee.com) or the power of Facebook’s domain. I’m unclear. 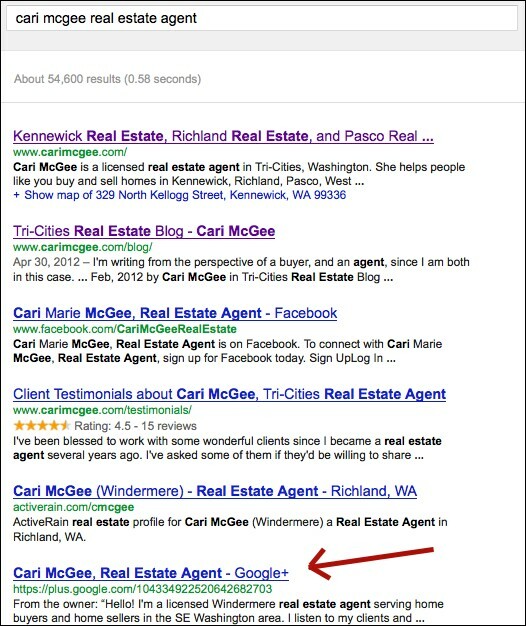 Wouldn’t such a specific search term – Cari McGee real estate agent – result in that high of ranking anyway? Or are you making a different point I’m unaware of? Bottom of Page 1 – Google+ account created with Google Apps for Domains. This account I can actually post to. Sure will be nice when they clean up that messy URL set of numbers and let us tweak/customize that part. Thanks for the case study though…I can verify seeing these pop onto page 1 or near for a few things I’ve been working on lately. +1 is clearly here to stay. I think this is interesting, but if you take the name out what do you get? I wonder if we will ever be able to rank a Google + page for dental TX or something of that nature.